I used the iOS app Drafts a lot the last time I was an iOS user, and I’m starting to fall in love again. Drafts lets you turn text into action – it’s a quick notebook, handy editor, and writing automation tool, all in one. IT WILL CHANGE HOW YOU USE YOUR DEVICES: Drafts gives you a new approach to using your iPhone, iPad, or Apple Watch, letting you write first and think about what to do with it later. Try it in your dock for a week, you’ll find you can’t live without it. 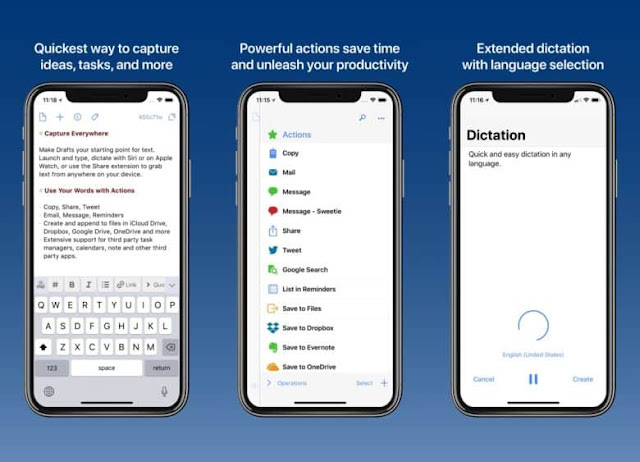 GETTING WORDS DOWN HAS NEVER BEEN EASIER: Drafts opens lightning fast and with support for capture via Siri, the widget, share extension, file import, and dictation - Drafts is like post-its updated for the smartphone era. POWERFUL ACTIONS: Actions make Drafts a Swiss Army knife for text. Integrate with a bewildering array of apps and services.